On tap this Labor Day weekend: something fancy. But makes Iggy Azalea’s “Fancy” sound as good as she looks. Introducing: the new line of super-luxe headphones from Master & Dynamic, available now. 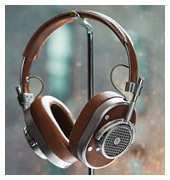 Just launched, the New York-based M&D crafts striking, industrial-looking headsets with some very nice details. And a rich, warm sound. On the outside: Forged aluminum body. Stainless steel components. Earpads that swivel on hinges. And those details: woven cords, hidden mute button, dual headphone jacks and a mic that’s actually within convenient distance of your face hole. Plus: really comfy ear pads. Credit the dual memory foam/lambskin construction. Each set comes with a canvas carrying case and a leather cable box. And its own metal display stand (sold separately). We immersed ourselves in the over-ear MH40, but M&D also crafts similarly styled on-ear ‘phones and some cool black and silver earbuds. The best way to experience all of these: pair ‘em with an hour-long playlist, as curated by InsideHook.